Figure 1: X-ray of subject location with out damage. WOW! A batch of circuit boards were drilled in a spot they weren't supposed to be drilled. This can be a tough mistake to recover from when dealing with today's complex, multi-layer circuit boards. Figure 1 is an x-ray of a board before the inadvertent drilling. Figure 2 is an x-ray of what this location looked like after the drilling. As a result, the customer found himself with a scrap heap of worthless product. What to do? As you can see by the x-rays, the area drilled had many circuits running through it. In addition to the top and bottom surfaces, there were four internal layers. Despite the complexity, big-time damage like this can be repaired. The approach we took was like the answer to the question, "How do you eat an elephant? - One bite at a time." Figure 2: X-ray of same area after drill damage. That is we had to do in this case, rebuild the location, one connection and one layer at a time. The first step - if you can believe it - was to drill again (Figure 3). We drilled a slightly larger hole to so we could manufacture a replacement plug that will be a uniform shape for all the holes in the batch of circuit boards. Next we began to re-construct the internal layers. 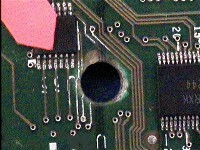 A specially machined plug was inserted and bonded in the hole to replace the core inner-layer of the board. 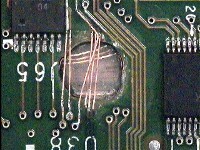 Once that piece was cured, the internal circuitry that occupied the space on either side of the core was replaced. Each internal circuit needed to be individually tinned and soldered. We used a special ribbon shaped copper conductor called a circuit track. See http://www.circuitmedic.com/products/201-3130.html. The circuits also needed to be insulated from the power and ground planes that may run through the area. After the internal traces were connected and tested, each open side of the plug was filled to the top and bottom surface with high strength thermo setting epoxy. 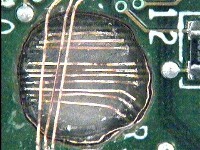 Figure 5: Replaced internal conductors and some surface conductors. Figure 4: Replaced internal conductors. 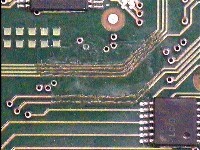 Figures 4 and 5 show the specially manufactured dowel plug bonded in place and the replacement circuit tracks either laying on the dowel surface (internal traces) or suspended in place (top and bottom traces). 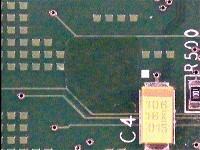 In this case, the circuit tracks for all layers were connected prior to the epoxy fill. Finally, top and bottom surfaces were blended cosmetically to complete the repair. Figures 6 and 7 show the bottom and top sides of repaired boards. That's it! Believe me this was one tough repair yet post repair testing proved that the repaired units worked as designed. We're mighty proud of our team of techs who had the patience, skill and discipline to undertake such a challenging project, and do so successfully.